PM Modi alleged that the opposition parties were "conspiring" against him. 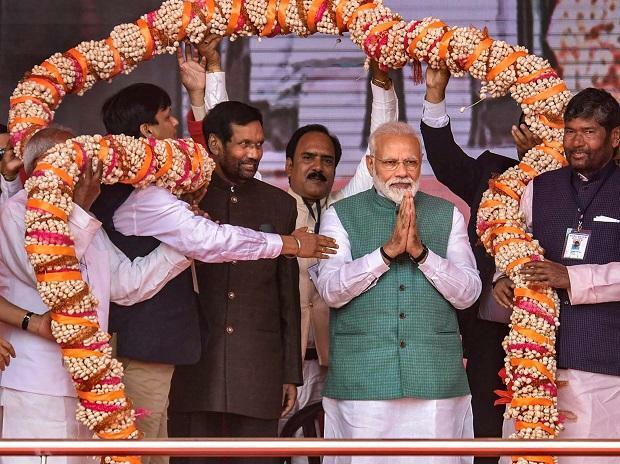 Prime Minister Narendra Modi with Union Minister and LJP chief Ram Vilas Paswan being garlanded during ‘Sankalp Rally’, at Gandhi Maidan in Patna, Sunday, March 3, 2019. The statements made by the opposition parties after the preemptive air strike on terror camps have made only people of Pakistan happy, he claimed. India conducted air strike at a Jaish-e-Mohammed terror camp in Balakot in Pakistan's Khyber Pakhtunkhwa province on February 26. "When the country needed to speak in one voice, 21 opposition parties gathered in Delhi to adopt a resolution condemning us. They are demanding proof from the armed forces for their act of bravery," the PM said at the BJP's Sankalp rally at Gandhi Maidan here. He alleged that the opposition parties were "conspiring" against him. "While I want to eliminate terror, opposition parties are conspiring to finish me," Modi said. "At a time when ourthe armed forces are fighting enemies across border and within India, some people are making statements to please Pakistan. This is New India, it does not remain silent on killings of its jawans," the prime minister stated. Talking about development work in Bihar, Modi praised Nitish Kumar-Sushil Kumar Modi combine for their achievements in the state, asserting that the NDA government wants to ensure that all sections in the state gain access to the best of facilities. The NDA government is working on all departments, including roadways, railways and airways, to improve infrastructure in the state, he said. Thanking Saudi crown prince Mohammed Bin Salman for increasing Hajj quota in India, he said the favour has not been extended to any other country. The PM also expressed his gratitude to the crown prince, who visited Delhi recently, for deciding to free 850 Indians detained on various counts. "This demonstrates India's improved standing and also exposes that Congress pursued politics for its own benefits," he added.